Getting out of bed in the morning is pretty much the worst. Who wants to leave a cozy, warm bubble and face the cold, harsh light of day? Not us—and apparently not baby dinosaurs, either. Experts say the little tykes may have spent between three and six months curled up in their eggs. The findings were published in the Proceedings of the National Academy of Sciences. Dinosaur embryos are very rare, which means their journey from fertilized egg to baby thunder-lizard is something of a black box. We do know they had a great deal in common with modern reptiles and with birds, and while both groups lay eggs, the length of their incubation periods vary immensely. Bird babies typically take a few weeks to hatch; reptiles can take months. Because dinosaur eggs were so huge, scientists believed they were probably more bird-like than lizard-like, hatching relatively quickly. It seemed probable that birds inherited their speedy incubation period from their prehistoric ancestors. 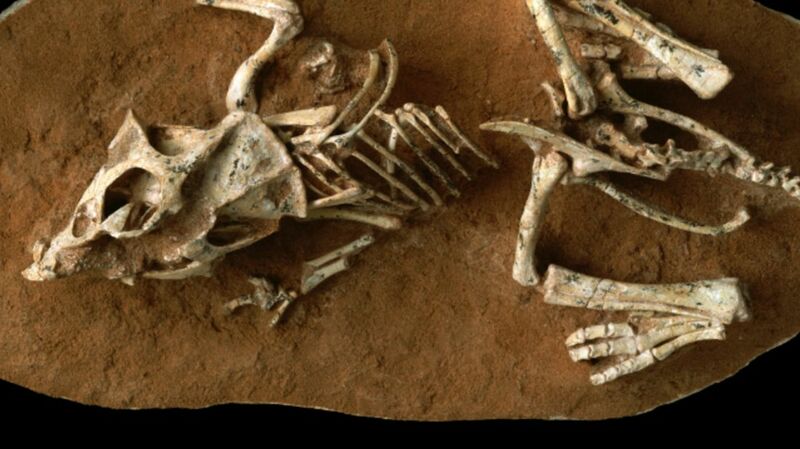 To find out for sure, the research team examined fossilized embryos from two dinosaur species: the sheep-sized Protoceratops and the gargantuan Hypacrosaurus, whose eggs were roughly the size of bowling balls. The researchers used computed tomography (CT) scanners and microscopes to get a closer look at near-invisible growth lines on the embryos’ teeth. "These are the lines that are laid down when any animal's teeth develops," lead author Gregory Erickson said in statement. "They're kind of like tree rings, but they're put down daily. We could literally count them to see how long each dinosaur had been developing." As it turns out, they’d been developing for quite a long time. Little Protoceratops had been in its egg for almost three months; Hypacrosaurus, twice that long. This long incubation period suggests two things: first, that dinosaurs were closer to modern reptiles than we thought, and second, that those eggs were vulnerable as heck. The longer an embryo sits around in its egg, the more protection and resources it requires, and the slower its development may be once it hatches. And that sluggish development may have contributed to the dinosaurs’ downfall. The faster a species can mature, develop, and reproduce, the faster it can evolve—a crucial factor in a world buffeted by dramatic climate change like that faced by the dinosaurs.